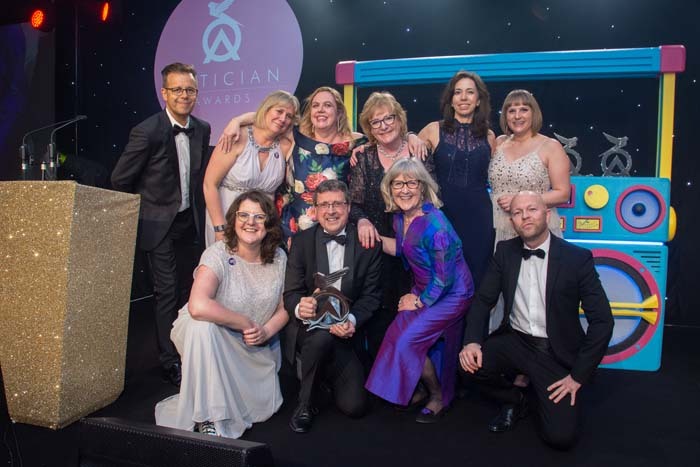 Frost Borneo Opticians on Hart Street are over the moon to announce that they’ve won the highly prestigious award ‘Independent Practice of the Year 2019’ at the Optician Awards. Neil Frost, Catalina Borneo and their team attended the black-tie awards ceremony at the Hilton Birmingham Metropole. After a nerve-wracking, but very enjoyable, glittering champagne reception and meal the winners of each category were announced by none other than ‘80s DJing legend Pat Sharp. Frost Borneo were up against six other independent practices from across the UK, all of whom had been shortlisted from the initial 100 plus entries that had been received in this category. On being announced as the winner and receiving the stunning art deco trophy, which can now be seen at Frost Borneo, it was noted that Frost Borneo ‘showcased everything great about independent practice.’ Not only this but the judges quoted that Frost Borneo ‘demonstrated thought-out detail at every stage of the practice, provided demonstrable customer satisfaction ratings and have a clinical offering that is not only wide ranging but also to an extremely high standard.’ The team went on to have a wonderful evening celebrating with champagne and dancing and, of course, the coveted winner’s trophy! Winning an Optician Award is the pinnacle of many optical careers, therefore after years of building Frost Borneo Opticians into the award-winning practice it is today, owners Neil and Catalina are hugely proud of having their hard work and dedication to excellence recognised. As the winner of the category ‘Independent Practice of the Year’ they had to demonstrate Frost Borneo offers outstanding customer service that goes ‘above and beyond’ as well as clinical excellence. The judges were looking for a practice that offers extensive product choice and knowledge, as well as having a great personality within their local area, links with other businesses and a high profile within the community. This all needed to be backed up with positive feedback from the practice’s patients. Frost Borneo were able to fulfil all these criteria and more.